It has been almost 6 weeks since Aina and Nurin left for UK. Everyday we talk via whatsapps and at least 2 times a week we do video call via hangouts. They update us about everything … last week we even did a video call while they were choosing their winter jackets just because they wanted our opinion on the jackets hehehe.. Some might say that we are too involved but who cares… we will always be here to give our opinion when asked! To tell you the truth, I think the girls are lucky to have a very caring dad.. always there to give opinion asked or not hehe. I sometimes lambat tengok message.. selalu terlepas keretapi in giving opinion. You should see him talking to the girls on the way to the airport… nasihat nasihat and more nasihat. My mum said she has never seen such a concern father… well, it was not easy for us to let them go especially we have never been apart. May Allah protect them always. 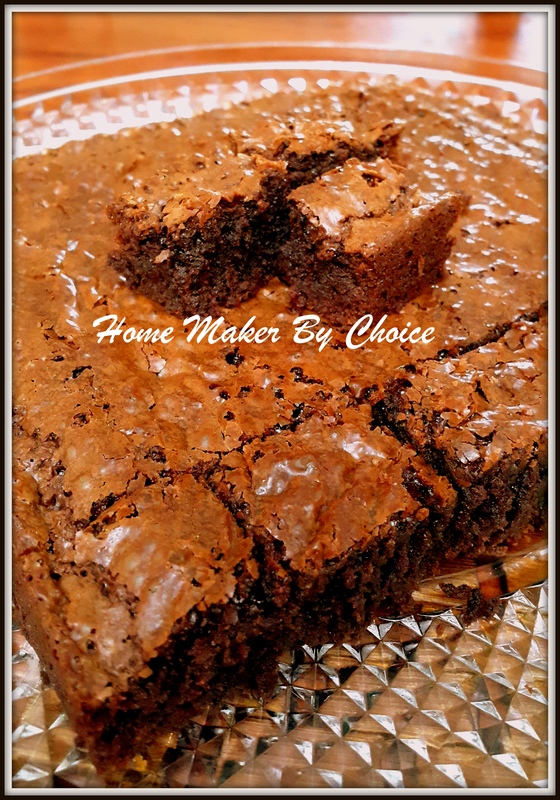 Okay.. back to our recipe today.. chocolate brownies kedut… quite famous sekarang kat Malaysia. I simply have to try it to see what the fuss is all about. Verdict? Yummy and totally worth it. 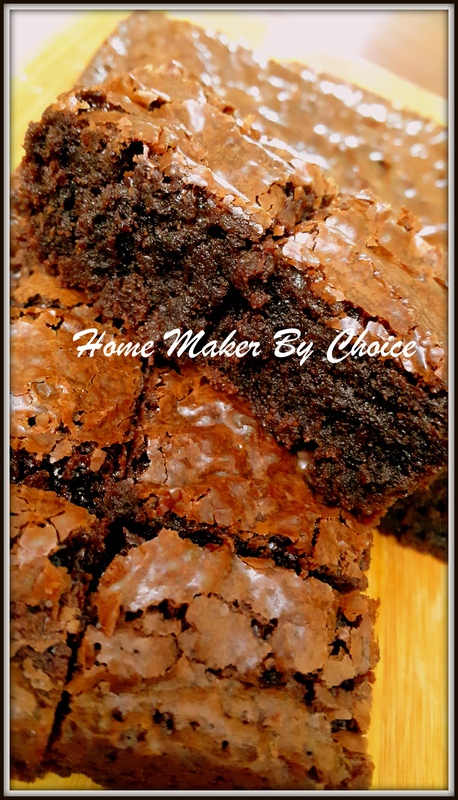 Very chocolaty and will satisfy all the chocolate lovers out there. 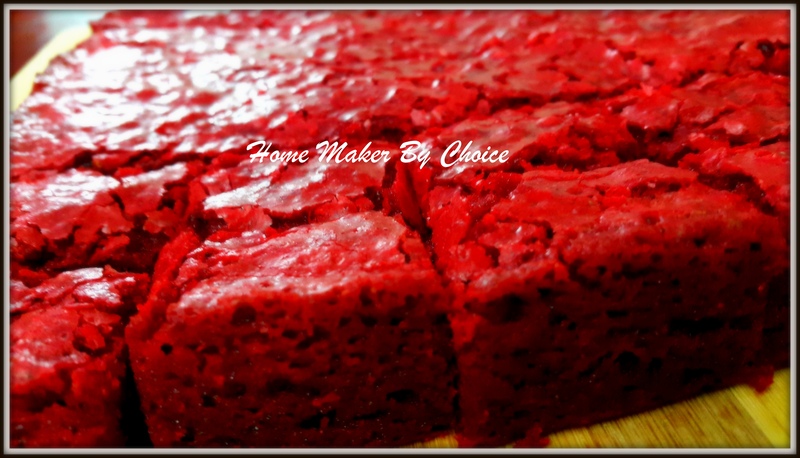 The recipe is taken from blog Azlita Masam Manis. Please try if you have the time. Melt chocolate and butter in double boiler. In another bowl, combine eggs, brown sugar, sugar and vanilla using whisk. Pour egg mixture into the chocolate mixture and mix well. Fold in the flour mixture and mix until just combined. Pour the batter into greased and lined 10″X10″ baking pan. Bake at 160C for 30 mins then off the oven and let the brownies sit in with door ajar for another 15 min. 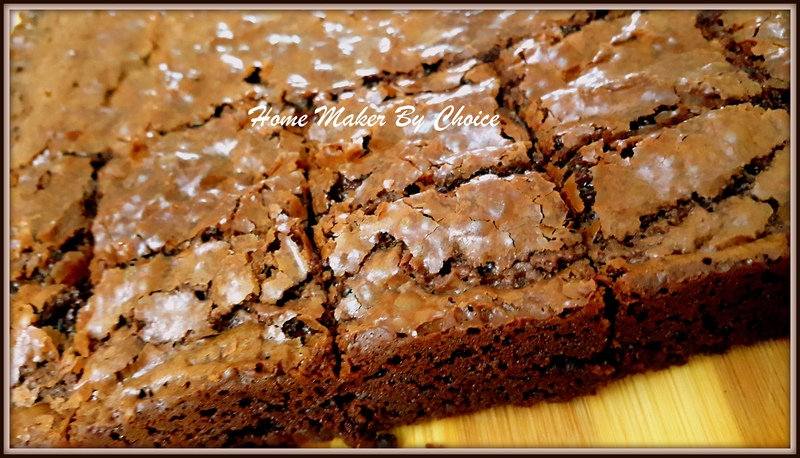 Soft and gooey texture… just the way brownies should be. Assalamualaikum and a very good day people. Hope life is treating you well. It has been a while since my last posting.. I believe that 16 March was the last time I update this blog. Honestly.. have not been baking much for the last 7 months… life took an unexpected turn and wiped out all my mood for baking.. Well.. there are things that are beyond your control and there is nothing you can do to prevent it.. so, redha aje la as they are tests from Allah. I am taking the approach that these tests are signs that Allah loves you.. He wants to pull you close to Him and always remember Him. May Allah grant me patience.. Ameen. Well..just a little update on what had happened during the last 7 months… my 2 girls left for UK to further their studies last Sept. Aina is doing her Bachelor Degree in Mathematics for Business and Finance at Portsmouth University and Nurin is doing her Foundation in Law at College of Portsmouth. The process of applying for the visa, accommodation and other stuff were really challenging .. it really made my other half and me appreciate all the government had done for us dulu. In sha Allah if I have time, I will try to write the whole experience and guide/tips for parents who want to send their kids to UK. Hmmm what else happened???? Aaaa.. we were fortunate enough to be Allah’s guest for the Hajj baru ni.. Alhamdulillah. Honestly there were times that I have lost hope to go for hajj this year but my other half keep on telling me to dua and ins sha Allah he said if Allah wants us to be his guest, He will give us the way and means to go. The schedule for us to leave for hajj clashed with the schedule for Aina and Nurin to leave for UK… I was really patah semangat but alhamdulillah, Allah sent us a friend that offered his help to take care of the girls once they arrived in London. Thank you Kazan and Angah for doing this. 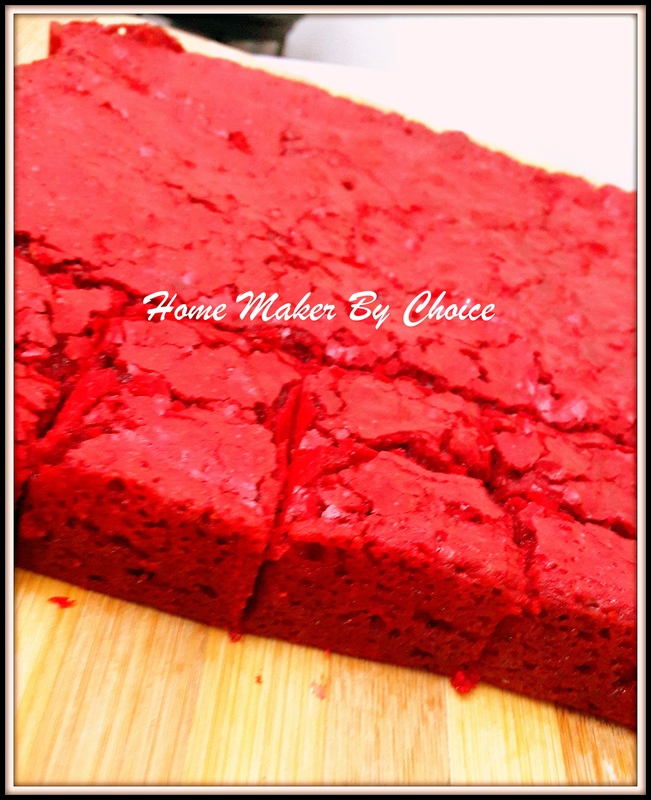 Orait.. lets look at the recipe that I want to share today. This is the 2nd time I baked this brownies and my girls love them very much. This recipe is taken from here. Melt chopped chocolate and butter in microwave and stir to mix. Add in sugar using a rubber spatula. Add in red coloring, vanilla essence and vinegar; stir to combine. Add in eggs one by one while stirring. Add in flour mixture* and stir until just combined. Pour brownie batter into greased and lined 8½” baking pan. Bake 170C for 35-40 minutes.